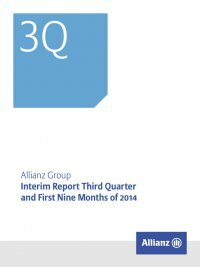 88 Interim Report Third Quarter and First Nine Months of 2014 Allianz Group 18 – Certificated liabilities Certificated liabilities € mn as of 30 September 2014 as of 31 December 2013 Allianz SE1 Senior bonds 6,647 6,581 Money market securities 1,029 869 Subtotal 7,676 7,450 Banking subsidiaries Senior bonds 510 580 Subtotal 510 580 Total 8,186 8,030 1 Includes senior bonds issued by ­Allianz Finance II B.V., guaranteed by ­Allianz SE and money market securities issued by ­Allianz Finance Corporation, a wholly-owned subsidiary of ­Allianz SE, which are fully and unconditionally guaranteed by ­Allianz SE. 19 – Subordinated liabilities SubOrdinated liabilities € mn as of 30 September 2014 as of 31 December 2013 Allianz SE1 Subordinated bonds2 11,332 10,856 Subtotal 11,332 10,856 Banking subsidiaries Subordinated bonds 251 254 Subtotal 251 254 All other subsidiaries Subordinated bonds 400 399 Hybrid equity 45 45 Subtotal 445 444 Total 12,028 11,554 1 Includes subordinated bonds issued by ­Allianz Finance II B.V. and guaranteed by ­Allianz SE. 2 Change due to redemption of a € 1.5 bn bond and the issuance of a CHF 0.5 bn bond in the first quarter of 2014, and due to the issuance of a € 1,5 bn bond in the third quarter of 2014. 20 – Equity equity € mn as of 30 September 2014 as of 31 December 2013 Shareholders’ equity Issued capital 1,169 1,169 Capital reserves 27,701 27,701 Retained earnings1 19,184 17,786 Foreign currency translation adjustments (2,234) (3,313) Unrealized gains and losses (net)2 12,380 6,742 Subtotal 58,199 50,083 Non-controlling interests 2,890 2,765 Total 61,089 52,849 1 As of 30 September 2014, includes € (215) mn (2013: € (220) mn) related to treasury shares. 2 As of 30 September 2014, includes € 252 mn (2013: € 203 mn) related to cash flow hedges.